After four zeros and 2,200 miles of driving I was more than ready to resume my hike. My first feelings were disorientation. I was back into the stream of hikers but the faces were all new. I went from six days of two to three mph hiking to three straight days of 70-plus mph driving. Fortunately, it didn’t take long to adjust. The trail is like that; you adapt and make friends fast. Here are some highlights and thoughts about the past week. 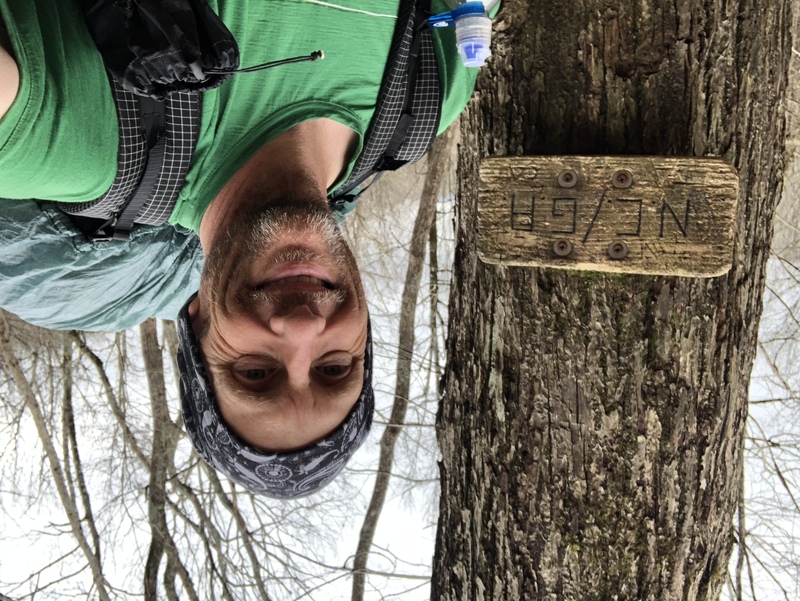 This week I really found my stride on the AT. I missed Dixie but was free to worry only about myself. I covered 96.5 miles, almost 14 miles a day, an average I’m very happy with. 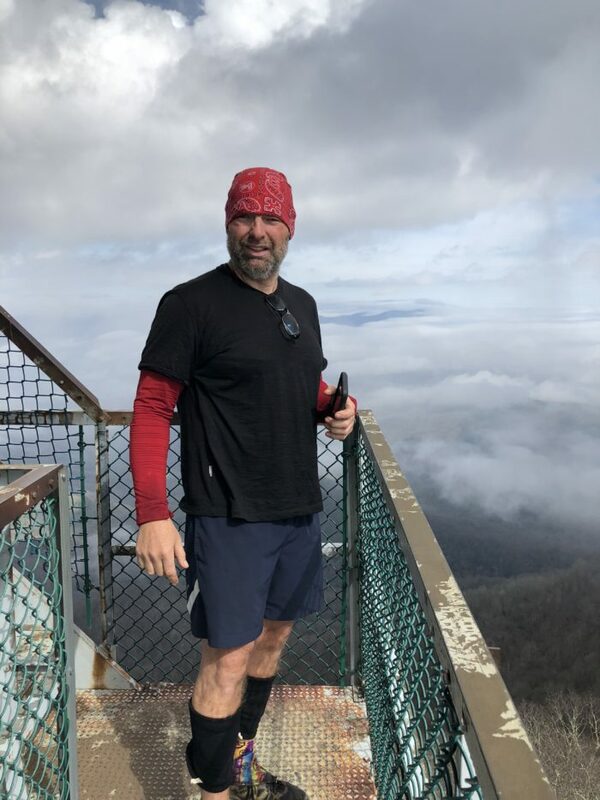 Geographically, I completed Georgia on the first day and arrived at Fontana Dam, the portal into Great Smoky Mountains National Park. 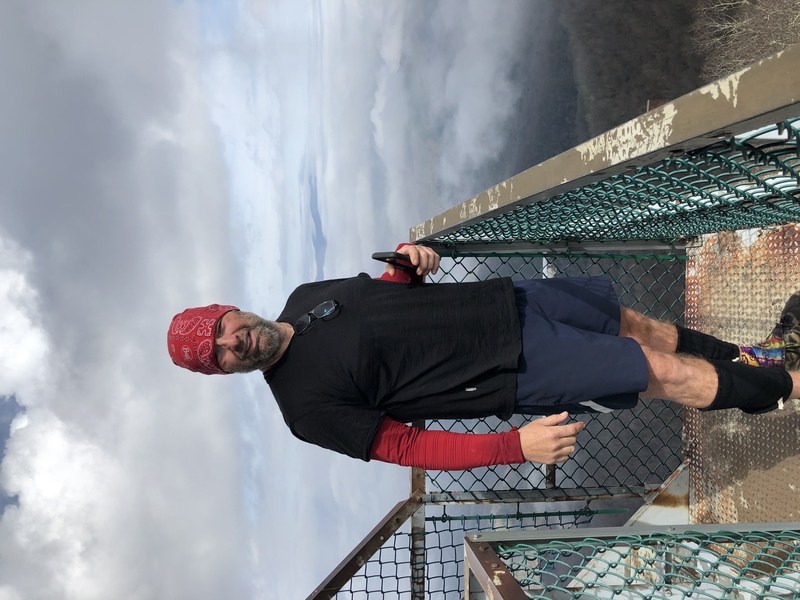 The views from the Albert Mountain fire tower were spectacular. Wayah and Wesser towers were completely socked in with fog. The Nantahala Outdoor Center, or NOC, was a great stop. 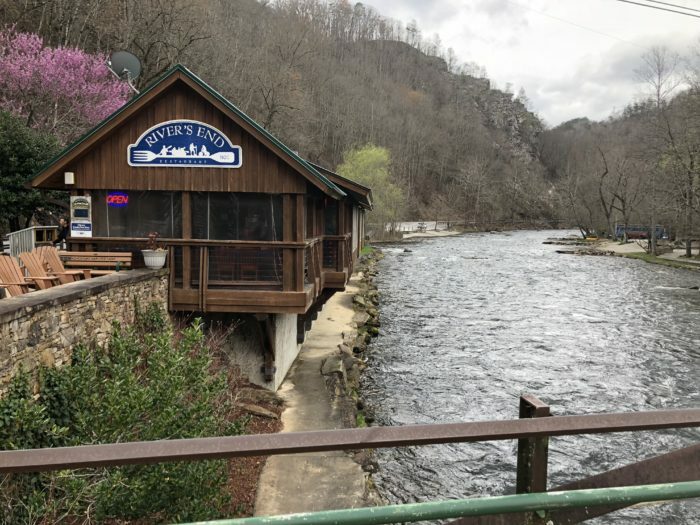 Cold beer, burgers, laundry, and showers, all while watching the river go by. 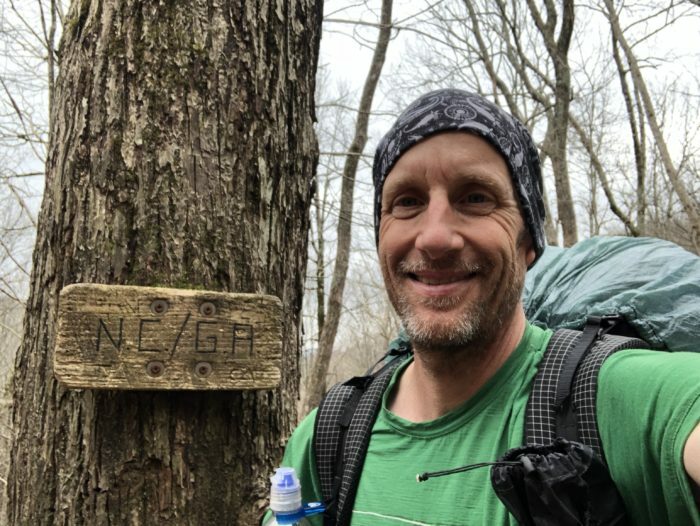 Socially, I met a lot of new hikers who become almost instant friends here on the AT. On Mount Albert I met fellow Trek blogger OneFoot and a few days later Toasty Nuts, another blogger. OneFoot, who later gave me my name. I was beginning to feel a little self-conscious about the lack of a trail name. Especially with the constant meeting of new hikers. I had ideas of self-selecting a name but wanted a name given by others. The morning after I met OneFoot the moment happened. 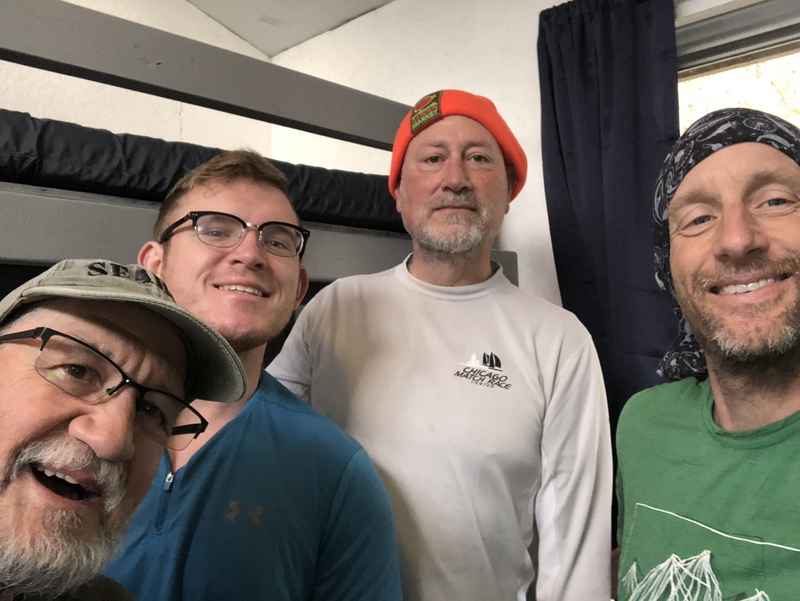 The night we met we happened to sleep in the same shelter next to each other, with a female hiker on my other side. It was a cold night, and at some point the three of us ended up in a big spoon. OneFoot apologized the next morning for invading my personal space. I was, “I didn’t mind, it was warm.” To which he replied, “Gee, you’re easy, Pete.” Laughter broke out and I had a name. Easy Pete. I like it because it was given and has a bit of a story. More importantly it matches my personality out here. I’m easygoing and try to make life easy for others. I also think the trail life is actually easy at its heart. It’s a big vacation, really. Bo stuck with three old guys. No one can hike the miles for you but the AT is a team sport. As I hike north I continue to think about all the help I’ve received from both on and off the trail. My off-trail support comes from family and friends. I’m grateful for the teamwork in getting Dixie to Wisconsin. Obvious thanks to Roberta, Al, and Dan for giving her a place to stay and for their support in allowing this dream of mine to continue. I’d also like to thank my mom and son for gathering and delivering Dixie’s bed, toys, and other items. On-trail support comes from fellow hikers, local businesses, and trail angels of every sort. The saying is, “The trail provides.” We share food, fuel, and whatever we need among ourselves. I’ve received completely unexpected trail magic from individuals who just want to help. 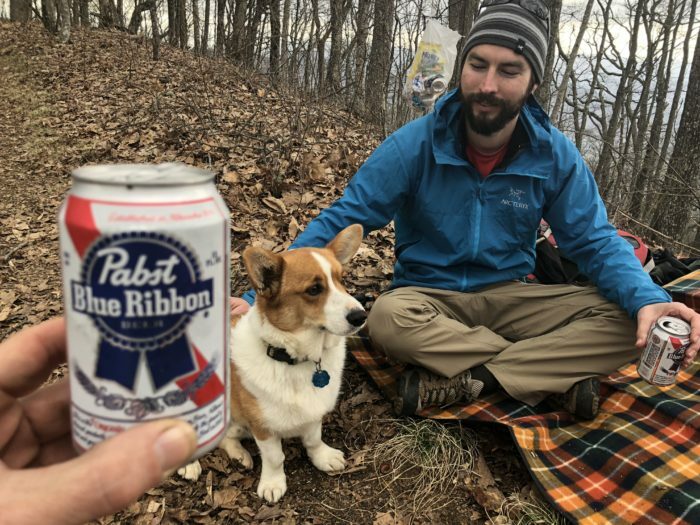 Free hot meals at random gaps and most unexpectedly from a former thru-hiker corgi handing out PBRs and snacks after a noteworthy climb up Jacob’s Ladder. Add in the various shuttles and hostel owners, generous day and section hikers, and all the supportive comments on social media and you get a sense of the support system. Sure, no one hikes for you, but I never feel I’m doing this alone. Lebowski and Bonefide doing some magic. Rain is a fact of life in the Southeast. I’ve found that except in the heaviest of downpours I don’t really mind walking in the rain. My pack is “water resistant,” meaning the material is waterproof but eventually water will enter through the openings, seems, stitches, etc. I have a Cuban Fiber cover on the outside and pack liner on the inside. I also have my sleeping bag and clothes in waterproof silnylon bags within the pack. It’s defense in layers and I feel secure while walking in the rain. Camping is a bigger challenge. My tent is a Zpacks Duplex. Very lightweight and large. I like it but it’s single walled and therefore prone to internal condensation. Ventilation helps but with all the hatches battened down for an extended downpour in air so humid you can see the vapor there is no chance of staying completely dry. The water condenses on the inside walls and the raindrops beating on the outside turn it into a fine mist. The morning after a long rain is always a soggy affair. Wiping the dew with a towel helps but the reality is that setting up and taking down in or after a rain involves a soggy, muddy mess. Ah, trail life. It does make the shelters more appealing. It’s just part of the life I’ve chosen so make it “easy” to accept and enjoy the rain. But really hope for sun. My name is Pete and I'm an aspiring Appalachian Trail thru-hiker. Like many this journey marks a time of transition. I'm from Duluth, Minnesota where the outdoor life is not so much a choice but simply the natural order. After college I spent 28 years as an Air Force pilot, moved many times, and saw a lot of the world under good and not-so-good conditions. Along the way I married, raised two boys to adulthood, and mostly lived the life I had planned, Until the day the plan went terribly wrong. In 2011 cancer struck my wife and in the summer of 2017 she lost her battle after a long and brave fight. Devastated but determined to keep living I've returned to Duluth and am set to start the AT in March. With all due respect to F. Scott Fitzgerald I believe there are second acts in American lives and this hike is the opening of mine. Thank you for visiting and I invite you to follow along with me. Maine or bust it is! Man Pete, this is awesome. You are inspiring to Stephanie and me! Easy Pete…I like it. Great to see the progress, both in miles and spirit. Keep it up! Thanks TJ. I’m having a great time. Everyone should do something like this once in their libertine. Wishing you all the best in your journey, will enjoy cheering you on from North Carolina!!! Thanks! I’m a fan of OneFoot myself. Thank you. I’m trying to update every 7-10 days or as connections allow.